Not too long ago we talked about how to effectively display testimonials in WordPress. As I said before, it’s one thing for you to say you’re good at what you do and another thing when others say you’re good at what you do. I agree with Jay 100%. Personally, I think it’s a great idea. Not only are you making it easy for people to provide a review for you, but you’re hi-lighting some of your best work in the process. What are you doing to showcase your work? 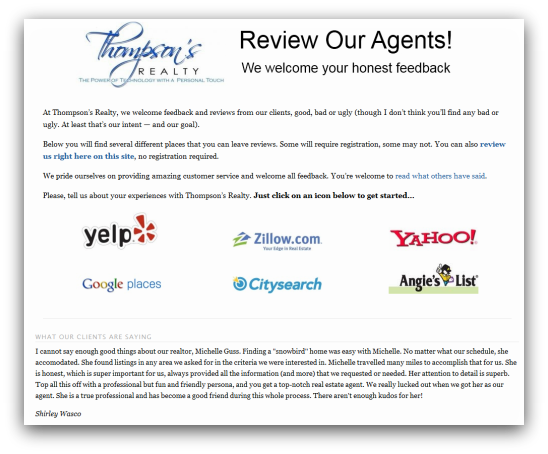 Do you have a testimonials page? If not, does this give you some ideas of how to maybe create one? what a great idea, I was just thinking of doing collecting testimonials, and now you’ve highlighted a best practice. Thank you so much! I think it’s important and effective. I really love how Jay created a space for others to willingly submit reviews through that site. The easier you make it, the better. And he’s hi-lighting some of his (and his Agent’s) best work in the process. Thanks for the comment and glad it inspired! In addition to offering a link for clients to leave testimonials, agents should also get in the habit of asking clients for a short video testimonial – video helps to establish those emotional connections which are sometimes lost in the written word. I work with a lot of agents and always tell them to use those smart phones and grab a short video (a minute or 2) after closing, at the property when they are taking down signs, etc. Just be sure to drop your clients a courtesy email before taking the video so they have a bit of time to think about what they’ll say – then upload them to a custom YouTube Channel and use them on WP, in email marketing, etc. She does a phenomenal job of collecting video testimonials from past clients. And these days, you don’t even need a video camera to record… You can shoot straight from your Blackberry or iPhone (thanks for making that point).